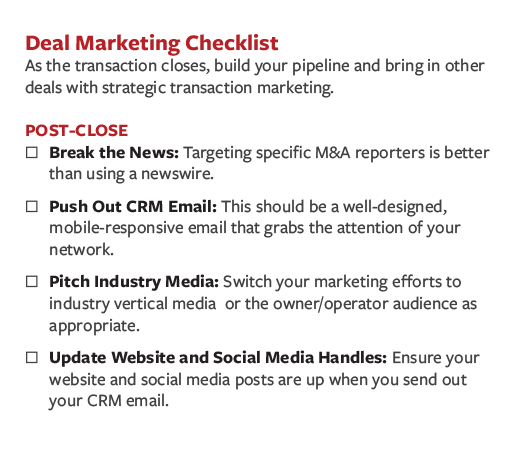 In the increasingly crowded mid-market M&A space, marketing your firm’s closed deals is a highly effective — and widely underutilized — deal sourcing support strategy. Generally speaking, there is nothing that does a better job of telling the market, especially prospective owners and operators, what types of deals you do and what you’re looking for than the one you just closed. Successfully marketing your transaction isn’t overly complex, but it does require some forethought and planning (which often falls by the wayside in the final push to get a deal done). We are big believers in the value of checklists. As a deal approaches its final stages, we create a tailored plan and organize it into a checklist to ensure every element is executed on time and on strategy. We generally break our activities into two buckets: 1) pre-closing planning and 2) post-closing execution. Before your new deal is finalized, it’s worth picking your head up — even if for just a moment — to consider how this transaction could help lead to your next. We get that this can be very challenging given the myriad activities that go into pushing a deal across the finish line (not to mention, that no one wants to count their chickens too early). Unfortunately, waiting until after deal closes to answer this question can lead to missed opportunities. Messaging: What is the message you want to send with the upcoming closing? Do you want emphasize the transaction itself (perhaps a high exit multiple) or focus on a broader acquisition strategy? Are there team or leadership elements that need to be highlighted? 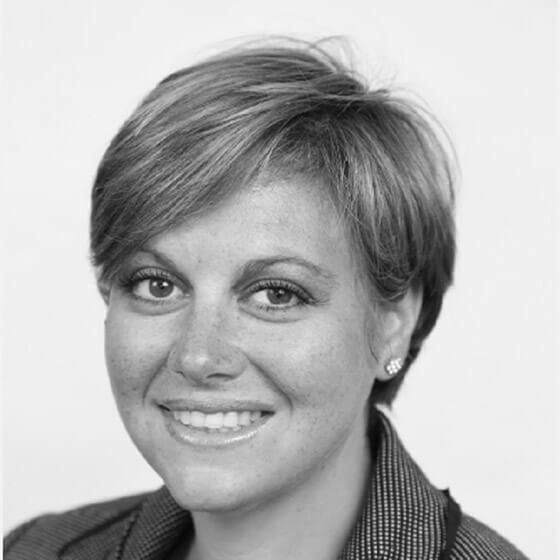 Target audience: What audiences matter as it relates to this particular deal? How will you reach them? Who can help deliver opportunities in the future?Are you looking to target prospective sellers or intermediaries — or both? Support: Will you handle the process internally or externally? Who will lead the writing, distribution, and media relations? What has or hasn’t worked in previous transactions? Distribution lists: Is your CRM / contact database up to date? How have you organized/selected your recipients? Approvals: What internal and external signs-offs are required on your announcement (company being sold/acquired, co-investors, etc.)? Do you plan to mention the legal, banking, and/or accounting representation you hired for the transaction? Coordination: Other parties involved in the transaction will also look to put out a release. Actively communicate your plans with relevant parties to ensure your announcement is not preempted unexpectedly. Writing: Whether you write your own release or leverage help from an outside agency, the sooner you begin putting pen to paper on your release, the easier the approval and coordination process becomes. 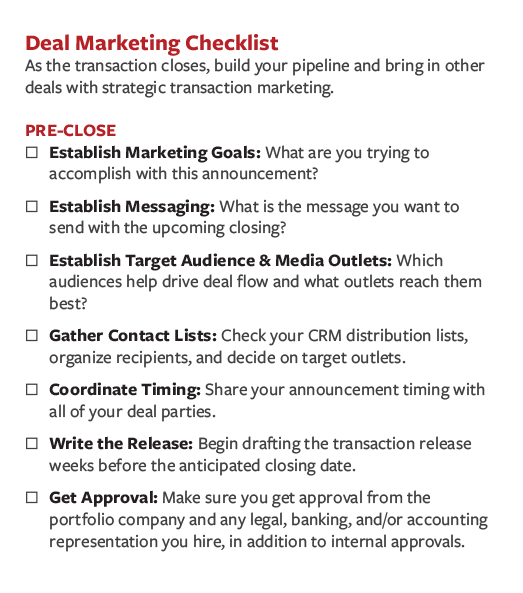 As the final pieces of your deal come together (and you begin to line up the champagne), try to make sure your marketing efforts keep pace. Ideally, your release is written, approved, and loaded into a mobile-responsive email template at least a week before the deal closes. We’ve been around the block enough to know that’s rarely the case and not always possible; however, suffice to say, the earlier the better. When it comes to news, there’s no time like the present. Marketing windows can open and close quickly, so don’t delay too far beyond your close date to get your ducks in a row. Break the news: For private transactions, newswires are rarely the way to go. They aren’t targeted and are often expensive for the results you might get. 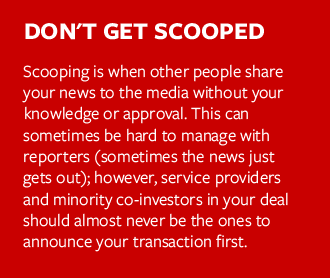 We suggest pitching M&A reporters directly by emailing your deal news in a short paragraph they can easily catch, understand and copy into their upcoming newsletters and stories. Either way, ensure you break the news to media before your CRM email goes out. Send a CRM email: This should be a well-designed, mobile-responsive email that grabs the attention of your network and contains details they likely haven’t seen yet in the media yet (for example, you can highlight your firm’s ongoing plans for this latest investment or whether it will continue selling assets in a particular industry). Go deep with industry media: As the M&A outlets begin running your news, turn your sights to getting press in the industry verticals related to your deal. This is often where the deal sourcing magic happens. This is an opportunity to reach operators, thought leaders, and prospective sellers in the industries you care most about. Don’t forget website and social: Your firm’s website is intended to be a living, breathing thing. Don’t let it get stale. Ensure it’s updated along with your social channels — yes, even Linkedin is social media! You invest your blood, sweat and tears (and a whole lot of capital) getting your deal done. Don’t miss out on an opportunity to let the right people in on the news. 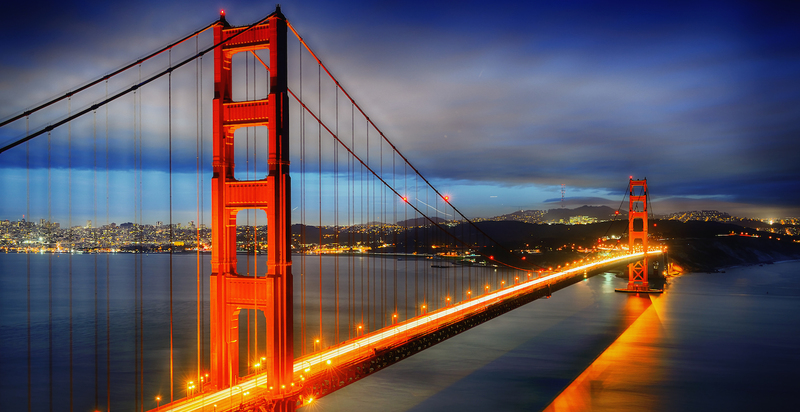 Transaction marketing done right can be deal sourcing gold. Don’t waste. A bit of thoughtful planning and careful execution can be the key to turning your latest transaction into your next one.